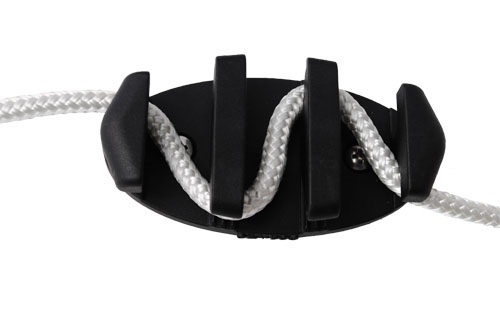 The trolley cord can be locked off first by 'zig-zagging' the cord through the cleat. Once enough anchor line has been deployed you can then lock off the anchor line on the same cleat by 'zig-zagging' the anchor line in the opposite pattern to the anchor trolley cord. The Zig-Zag cleat will effectively hold cord up to around 6mm diameter. We recommend bolting a zig-zag cleat to your kayak if you can access the back of the area where you want to mount it. Marine Trifold rivets can be used but often the 'teeth' of the zig zag cleat are too narrowly spaced for a standard pop-riveter to access but it is possible if you use push the head of the pop-riverter hard against the cleat, gently forcing the teeth to seperate allowing you to pop the rivet. Well Nuts can also be used as an easier option. We offer a delivery service for the Zig Zag Cleat throughout the UK & Ireland to home and work addresses. Buy a Zig Zag Cleat online from our website and collect from our shop in St Columb Road near Fraddon in Cornwall or you can collect from any branch within the Canoe Shops Group. There is no cost associated with instore collection*. Give us a call on 01726 862798 if you have any questions about the Zig Zag Cleat.